I love hanging out with Michelle and her family! We did a family session not too long ago, so her kids were all smiles when they saw me again. I got to witness Michelle's oldest son wake up his Dad by pulling off the covers, the kids drawing on the kitchen floor (there's a cabinet full of art supplies! ), Dad making the most elaborate and delicious-looking breakfast I've ever seen, the whole family eating and chatting at the table, Michelle doing the cleanup while wearing 'the gloves', the kids brushing their teeth, and everyone piling into the van for a fun day ahead. They really are the most amazing family and I'm so grateful to have spent the morning documenting their routine. 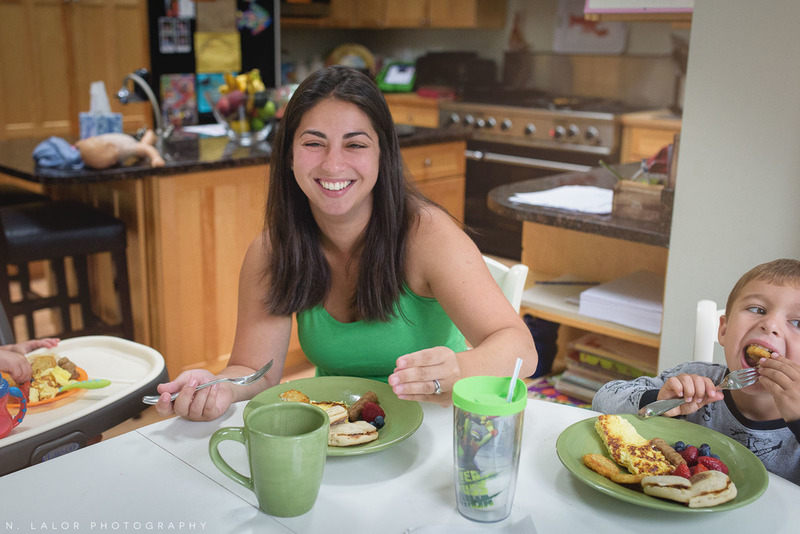 And don't forget to read Michelle's post about her morning on Fairfield County Mom's Blog.